Symphony Nova Scotia presents over 20 free concerts across Nova Scotia with its second annual summer season! HALIFAX, NS – This summer, Symphony Nova Scotia proudly presents its second annual summer season, featuring more than 20 concerts and events in public venues throughout Nova Scotia. The festivities will feature Symphony Nova Scotia musicians giving live performances at venues including the Rebecca Cohn Auditorium, the Halifax Citadel Garrison Grounds, the Halifax Central Library’s O’Regan Hall, and public libraries across Nova Scotia. Highlights include a charming afternoon concert with Halifax Pride at the Halifax Citadel, a free multimedia celebration of Shearwater’s 100th, free all-ages concerts at the Halifax Central Library, and two Pride concerts with star drag performer and classical musician Thorgy Thor, famed from the hit show RuPaul’s Drag Race. Plus, thanks to the support of Nova Scotia Public Libraries, Symphony Nova Scotia’s beloved Classical Munchkins program for preschoolers takes to the road this summer, touring to 15 communities across our province. The full-orchestra concerts will be conducted by Daniel Bartholomew-Poyser, Symphony Nova Scotia’s Artist in Residence and Community Ambassador. “We’re absolutely delighted to be back with another fantastic lineup of free summer performances throughout our community,” says Daniel. Bring your preschooler and learn about music with our fun, interactive Classical Munchkins program! Thanks to the support of Nova Scotia Public Libraries, these fun, free, hands-on sessions with Symphony musicians tour to 15 communities across our province this summer, including stops in Truro, Antigonish, Sydney, Digby, Liverpool, Westport, and many more. See the full schedule here. In partnership with Halifax Pride, Symphony Nova Scotia presents a free afternoon concert packed with wonderful waltzes, peppy polkas, and catchy classics, all selected and led by the Symphony’s effervescent Artist in Residence, Daniel Bartholomew-Poyser. Join Symphony Nova Scotia bassist Max Kasper and the Library Players for these free, noon-hour library concerts! This time, the Library Players explore the progress of some of the world’s most brilliant child prodigy composers. With music by Mozart, Mendelssohn, Purcell, Barber, Bizet, and a few other young ‘uns! Thorgy’s Thorchestra! Symphony Nova Scotia proudly presents a thrilling, thoughtful, and hilariously theatrical show featuring the fabulous Thorgy Thor, famed worldwide from the hit show RuPaul’s Drag Race. 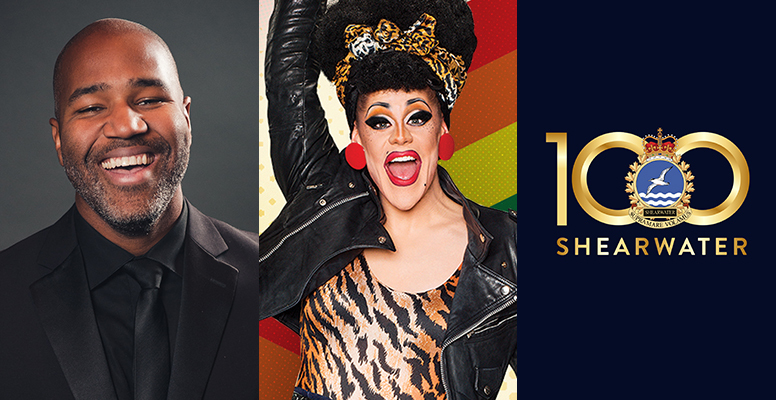 With an outrageous fashion sense, razor-sharp wit, and virtuoso chops on violin, viola, and cello, Thorgy is the reigning “queen of classical music!” You’ll laugh, you’ll cry, and your heart will throb as Thorgy enthralls and inspires you with song, dance, and hilarious symphonic shenanigans in this can’t-miss celebration of Pride, Canadian LGBT2Q+ history, and much more. Thorgy’s sure to leave everyone feeling incredible! Come on out and hear Symphony Nova Scotia performing live at the Halifax Central Library’s O’Regan Hall! In this relaxed, family-friendly concert, Symphony Nova Scotia and conductor Daniel Bartholomew-Poyser perform a lively selection of summery symphonic music. Hear excerpts from Rossini’s The Barber of Seville, Handel’s Royal Fireworks Music, Mozart’s “Jupiter” Symphony, and much more! This concert is a great way to experience a live orchestra for the first time, and all ages are welcome. Come early to get a seat! Join Symphony Nova Scotia’s full orchestra for a lively, stirring, multimedia concert honouring the 100th anniversary of 12 Wing Shearwater. Since its founding in August 1918, Halifax’s maritime aviation community has played a crucial role in our city, our country, and our world. Come celebrate its legacy with a grand selection of glorious symphonic music from the martial tradition, including William Boyce’s Heart of Oak March, the official Royal Air Force March Past, The Dam Busters March, and excerpts from Edward Elgar’s beloved Land of Hope and Glory and Enigma Variations. Plus, experience Shearwater’s new 100th anniversary video with live accompaniment, and hear Symphony Nova Scotia’s first-ever performance of a powerful work by decorated World War II fighter pilot Robert Bruce. This concert is open to all ages; come early to get a seat! This concert is made possible through the generous support of the City of Halifax. Shearwater 100th Anniversary celebrations are proudly supported by the Title Sponsor, Bluedrop Training & Simulation. Learn more at www.shearwater100.com. For more information about Symphony Nova Scotia’s summer season, visit www.symphonynovascotia.ca. Symphony Nova Scotia is Nova Scotia’s orchestra. With a home base in Halifax and performances across the province, Symphony Nova Scotia reaches more than 50,000 Nova Scotians of all ages each year with a diverse mix of concerts, free community programs, and educational outreach. It is the largest employer in Nova Scotia’s cultural community, and has won many awards, including five East Coast Music Awards for classical music. Visit symphonynovascotia.ca to learn more, listen online, or get tickets today!